Having too high a voltage (overvoltage) can result in permanent damage to electrical devices due to overheating (probably blowing a fuse). Undervoltage, on the other hand, usually means the appliances cannot function, but can be damaging for appliances that employ the use of motors (like a fridge). In Japan, the voltage for electric mains is 100 V. While this number is pretty unique in the world, many countries in North America, Central America have voltages which are 110V or 120V. Most of the rest of the world (Europe and Asia) have 220-240V residential voltages. If you are unsure of your domestic voltage, refer to this. Most electrical appliances can withstand a 10-20% difference but generally speaking, overvoltage is more dangerous. Using a device designed for 110V or 120V in Japan leads to a slight undervoltage, which means it will most probably still work. However, high-powered electrical devices (high wattage) like hair dryers, boilers and ovens are more sensitive to changes in voltage and slight over- or undervoltage should be avoided. For devices made for 220-240V, they will almost certainly not work. Most electronic devices like cell phones, cameras and laptops have dual-voltage AC chargers and hence work with 100-120V and 220-240V mains. To verify if your device or appliance is dual-voltage, look for information on the device or the charger. A typical power specification on a laptop charger. Keywords to look for are INPUT, AC and V. “100-240V” in the image above means that this laptop adapter handle dual voltages. If it the device intend to use is absolutely irreplaceable, like a personalised medical equipment, do consider the use of converters. Depending on whether you are expecting an overvoltage or undervoltage, you will need to step-down or step-up the voltage respectively. When choosing a converter, ensure that it can supply at least 1.2x the wattage of your appliance/device. Interestingly, in Japan, utility frequencies (or cycles) are split between 50 Hz and 60 Hz. 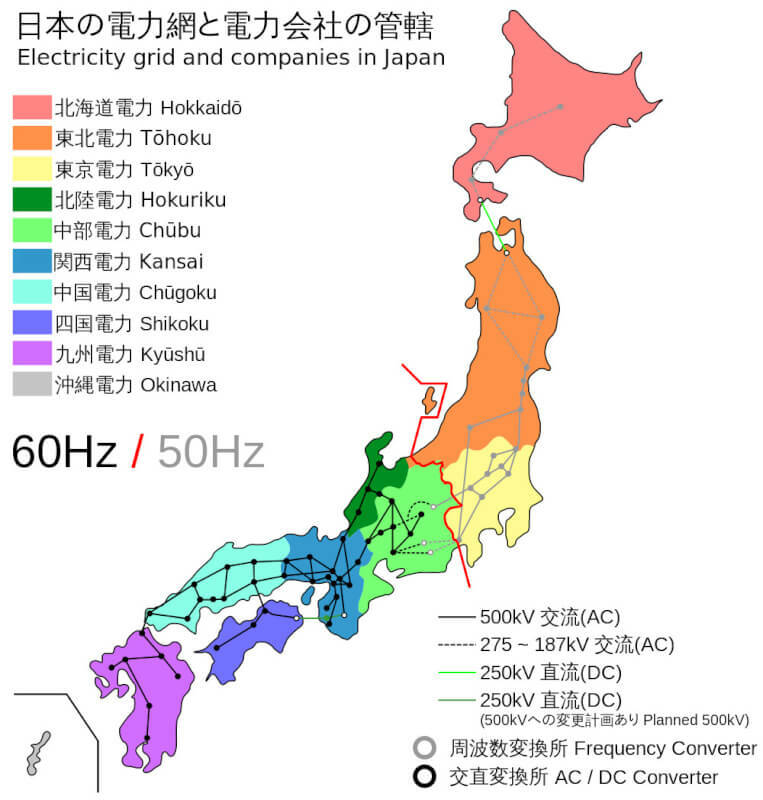 Kanto (where Tokyo is), Tohoku and Hokkaido are on 50 Hz while the rest of the west (Kansai, Kyushu, etc) are on 60 Hz. For most devices, the difference in frequency does not really affect functionality. Devices that are affected are mainly those that have motors or in-built clocks (e.g. a coffee machine). The former will see motors spinning at different rates, while the latter will lead to inaccuracies in internal clocks that are pegged to rate of electric current. Electricity network in Japan. Image courtesy of Wikipedia.org. The type of plug and socket system used in Japan is known technically as the JIS-C 8303 and comes in two variants – a two-slot outlet (unearthed) and a two slot + one round slot (earthed). They are also known as the Type A and Type B systems respectively (see image below). Type A sockets tend to be more common in Japan and Type A plugs can fit Type B sockets too (usually not vice versa in the case of wall sockets). While the system in Japan is largely similar to North and Central America, there are some slight differences. For example, in Japan, the Type A plugs have identically-sized pins while in the US, one pin is wider than the other. In most cases, the plug will still fit the socket but there is also a small possibility that they won’t. For the rest of the world that use different plug and socket systems, adapters can be bought to convert the plugs to Type A or B plugs. 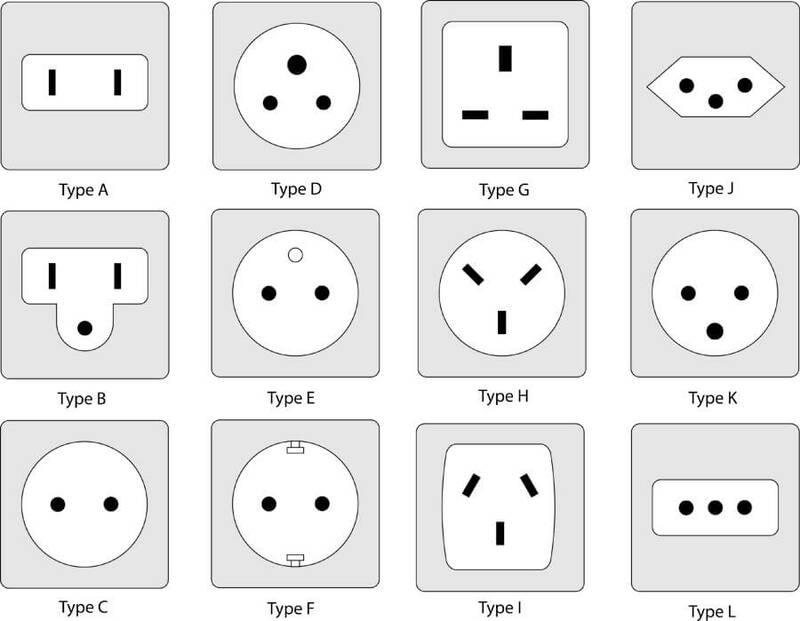 Various socket types in the world. Type A and Type B are used in Japan.